Members of the Kootenai County Constitution Party are planning to protest today the dedication in Coeur d’Alene of a public artwork sculpture of the Hindu god Ganesha – a four-armed being with an elephant head. A posting on the party’s website encourages Christians to protest the artwork, calling it an “abomination” approved by the “godless group of individuals” who manage the city’s public art program. 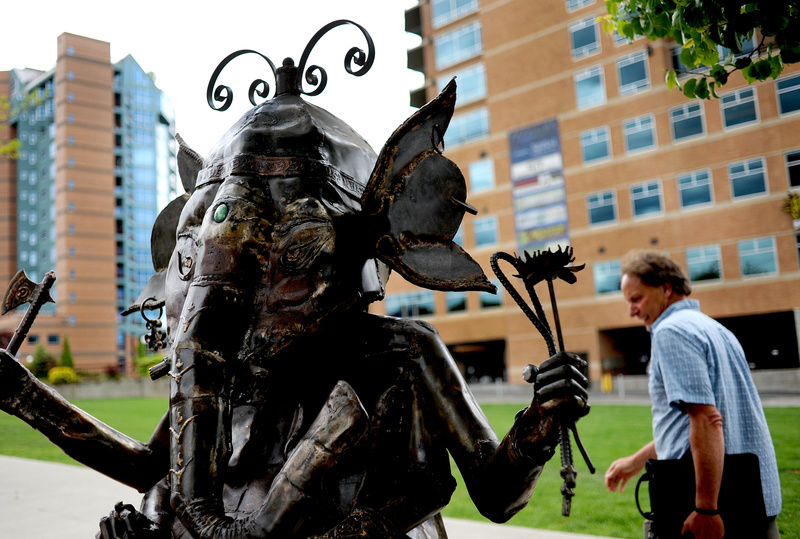 The Ganesha sculpture, created by Spokane metal artist Rick Davis, is one of 14 being dedicated today throughout downtown Coeur d’Alene as part of the city’s new “ArtCurrents,” a public art program. In ArtCurrents, which will reoccur annually, artists own the sculptures, which remain in place for a year and are offered for sale. The city receives 25 percent of the proceeds of any sales. This year’s sculptures come from artists in Washington, Idaho, Montana, Nebraska and Wyoming, said Steve Anthony, the city’s staff liaison to its Arts Commission. Proposals were solicited from artists, and a citizens committee selected about half of the submissions. The artists received $500 stipends. The sculptures depict everything from a giant stand-up bass to a woman playing with otters. There are elk, moose and deer. Other subjects include St. Francis of Assisi and a Native-American-themed “spirit bear,” which in some tribes represents harmony and peace, according to the program description.